​We have no idea what this is about, but surely it's an embarrassment for Major League Baseball, which will once again have to answer for one of their umpires going rogue. 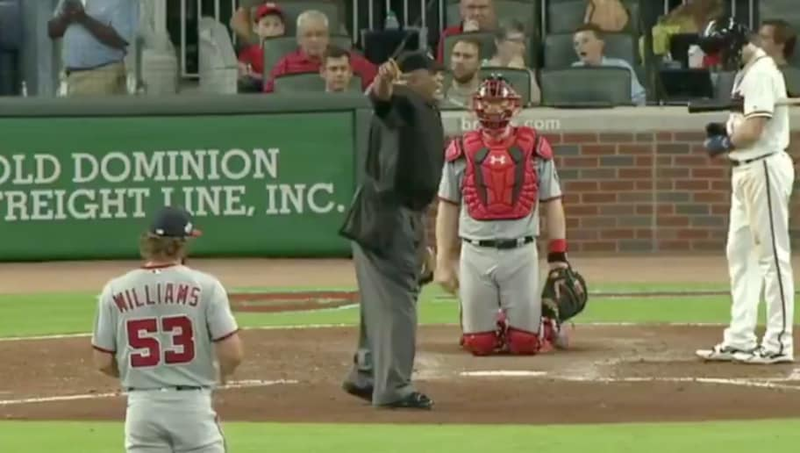 Umpire Laz Diaz made a scene at SunTrust Park, screaming at Dave Martinez while pointing at ​Bryce Harper in center field. For now, we have no idea what the problem was, but it looks utterly ridiculous. You know what baseball needs more of? Umpires slowing down the game with selfless tirades. Martinez and Harper handle this about as well as they can. The skipper tries to figure out what Diaz's problem is, while ​Harper simply stares in from center field and shakes his head. We feel you, Bryce. Nothing like a good ol' fashion ump show. Unless Harper is literally yelling obscenities at fans in the outfield, there's no justification for being this demonstrative behind the plate, especially when your main job is to make the right calls and be an afterthought.